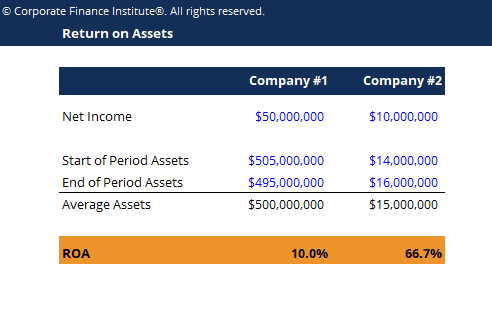 This return on assets template will help you calculate return on assets using net income and the amount of start of period and end of period assets. Return on Assets (ROA) is a type of return on investment (ROI)ROI Formula (Return on Investment)Return on investment (ROI formula) is a financial ratio used to calculate the benefit an investor will receive in relation to their investment cost. It is most commonly measured as net income divided by the original capital cost of the investment. The higher the ratio, the greater the benefit earned. that measures the profitability of a business in relation to its total assets. This ratio indicates how well a company is performing by comparing the profit it’s generating to the capital it’s invested in assets. The higher the return, the more productive and efficient management is in utilizing economic resources.